Can ‘The Autograph Collection’ make Marriott fun? Can ‘The Autograph Collection’ finally make Marriott Rewards exciting?! When we were down in Dubai last week, I noticed that there is a new Marriott Rewards redemption option. Having a collection of Marriott Rewards points did not previously serve you well in Dubai if you wanted a beach resort. There is, of course, the amazing JW Marriott Marquis (which I believe is the tallest ‘all hotel’ building on the planet) but that is not on the beach. The Ritz-Carlton IS on the beach but comes at a very high price – 70,000 points per night. There is now another option. 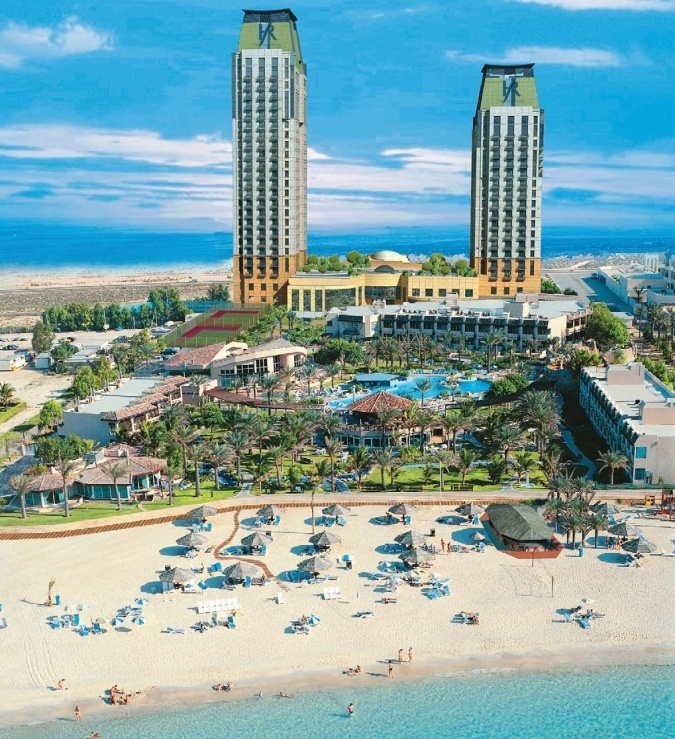 The Habtoor Grand Beach Resort & Spa pictured below has joined the Marriott ‘Autograph’ collection. ‘Autograph’ is a group of independent hotels which retain their own branding but which allow guests to earn and spend Marriott Rewards points and respect Marriott status privileges. At 40,000 Marriott Rewards points per night, this is not a bad deal. You should get my oft-quoted 0.5p of value per point and at peak times you will do a lot better. Last week, for example, Habtoor was asking £270 including tax for a Tower Room but still had reward availability. Autograph is turning out to be a clever move by Marriott. What they are doing is approaching independent five-star hotels and offering them a loose marketing arrangement. They can appear on the Marriott booking system and they will be bookable by companies who have corporate deals with Marriott. All Marriott Rewards benefits (status, earning, redeeming) are honoured. Apart from this, though, the hotels all retain their individual names and identities and can continue to operate in their own way without reference to Marriott standards. The Autograph Collection home page is here. The UK properties are all very well regarded hotels – St Ermin’s in London, Threadneedles in The City and The Glasshouse in Edinburgh. The Atlantis resort in The Bahamas is included and other Atlantis properties, including Dubai, are expected to follow. In New York it has venerable names such as the Alonquin and The Lexington. If you have been looking to use a pile of Marriott Rewards points, you could do a lot worse than taking a look at what The Autograph Collection has to offer. Hilton liked the idea so much that they have started a clone called Curio Collection. There are only 9 properties so far and not all of those are open. The first European site will be a new opening, Reichshof Hamburg, due to open next month. It looks like a stunning refurbishment of a historic art deco property. How many BA passengers with status use Terminal 5 in a day? I’ve got a booking at Atlantis, Bahamas for October half term and reading this in the Dubai atlantis, so to be able to book using rewards would make it very, very interesting. I’ve had a marriot account for a while but never used the points. Any idea when the Dubai atlantis is likely to join? Not been to the Bahamas Atlantis, but it looked very similar to the Dubai version, which is why we decided to go. Booked through Kenwood travel who were very competitive when we booked. We’re going to Orlando first, on Virgin UC, then on to Nassau and flying back in F from New York. It was booked before the announced avios devaluation, when suddenly there was lots of availability and I probably could have got 4 seats a bit easier, but it’s during October half term and didn’t look at other options as I was happy with the booking. I booked the hotel when Kenwood had a sale on, in January, and they were a lot cheaper than all the other online quotes. Very efficient and pleasant to deal with. B&B, in an ocean suite, at the Cove came in at just over £240 a night for 2 adults and 2 children which I though was a good price at the time during school holidays. Is this an old post? Both the autograph collection and Hilton’s Curio brand have been around for a while, years even. Kimpton, the very welcome addition to IHG, has been operating on this model. Very individual hotels under a wider brand. Given Raffles’ predilection for Dubai, the Autograph Collection has only now become of interest with this new Dubai property… I must say, looking at that picture makes me wonder why anybody in their right minds would choose to go there more than once, even if family live nearby. My parents, who are on a cruise at the moment with a stop off in Dubai, had exactly your view, until they came to the hotel and went round the water park and remarked no wonder you never leave the hotel! For families you can’t find a better place IMO and the kids absolutely love it. Each to his own, though. But why would anybody want to go to a place where the only attraction is the hotel, to the extent that you don’t want to leave the hotel? That’s not travel! Going on holiday with small kids is NOT ‘travel’, it’s a holiday. If that means you stay in a luxury resort all week and your kids and wife are happy, it does the trick. Save the ‘travel’ for before kids / after kids / older kids. Even without kids it’s just nice occasionally to get a few days complete relaxation now and again. We’ve just come back from a combined trip to Berlin and Dubai (travelling between them on an AirBerlin J redemption) – the former was non stop culture and history after which a few days at the Sofitel on The Palm was very welcome especially with Platinum benefits courtesy of Amex. They were falling over themselves to be appreciative of our ‘loyalty’! re Kimpton they were fantastic hotels in a small chain and mostly each interesting and nicely run. I’ve been a bit worried since they joined IHG, that standards would drop and the experience be less personal. I wasn’t aware IHG is running them in this more hands-off model. So I’m less worried now and will keep using them. No, I’d just never covered it before and the Dubai resort was a good excuse. As per the Starwood announcement, it is also picking up steam as an industry trend. If you live in the UK it is also still a minority interest given the low number of properties. Stayed at the St Ermins in London on a number of occasions with work. Really nice hotel. As a Platinum holder I was upgraded to a suite on one occasion which was superb! First hotel is Royal Palm South Beach Miami. Looks like they were caught off-guard, scrambling to keep up, to launch with just one hotel and 4 coming-soons all in the southeastern US. I’ve stayed at the Habtoor (pre-autograph). It is next to the Ritz Carlton at Dubai Marina. It’s a nice enough hotel, but absolutely swamped with Russians. Not any more. Russian visitors to Dubai are down 80% this year I was told last week. There’s hardly any here either. Although the Russian gentlemen, with supermodel partners, punching way above their weight( wonder how they do that:-)) has reduced some of the entertainment value at dinner. Don’t forget the 5th night free with Marriott redemptions. So 160,000 points for a 5-night stay or 32k reward points per night.